Part 2 – Did U. K. Military Attack UFO in Wales On Feb. 26, 2016? 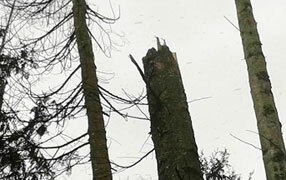 Many trees and dozens of branches were snapped off 20 feet above ground in Smilog Forest near Llantrisant, Wales, on February 26, 2016, after helicopters and large planes showed up between 2:30 to 4 AM above Pentyrch, Cardiff, Wales neighborhood some 2 to 3 miles from Llantrisant. Eyewitnesses in Pentyrch saw large UFOs in air at same time and later investigated evidence of snapped off trees and other anomalies in Smilog Forest near Llantrisant. Image © SUFON - All Rights Reserved. Previous PostPrevious Part 1 – Did U. K. Military Attack UFO in Wales On Feb. 26, 2016?